The Fit: I was wearing the Biking Through Brussels A Line Dress in Forest to the ModCloth IRL opening, and the CEO, Matt Kaness, asked if I had owned any of the previous dresses they released in this style. I own the In Bloom one from last year and he asked if I noticed a difference in the fit. I answered honestly and said that immediately that I didn't and I asked why he asked. He explained that they narrowed the chest on the fit model they used to cut the dresses, so it should fit better up top in smaller sizes. (I'm an XS for measure). I read through some reviews raving about the change and within the next week or so wore the In Bloom dress for comparison and I did find that one to run a little bit bigger than my Forest one, or now even my Houndstooth dress. That said, I don't think anyone would notice that it was slightly looser on me--I didn't even totally notice because I'm not only on the smaller size bust wise, but I'm very narrow in the rib cage area in general and I tune out dresses that aren't perfectly snug in that area because it's basically white noise to me. This all said, now that all of this has been brought to my attention, if you're built similarly to me, this dress will fit great but it won't be necessarily as snug as a bug in a rug around your chest. * But again, this would have been white noise to me if all of this wasn't pointed out. The long and short of it: the newest Biking in Brussels dresses are more properly sized. But depending on your measurements, there still may a little bit of, um, "room to grow"*, regardless. BUT...you'll love this dress and I couldn't be more thrilled with this purchase! *I realized upon writing and reviewing this before publishing that I may not have the correct capacity to accurately measure how much this dress has changed. Between a busy first half of my summer and a chronic illness flare up since August, I have lost some weight from not eating enough initially due to my schedule and then losing a lot of my appetite. I don't believe it's noticeable to the naked eye, but some of my clothes are fitting differently. I have some skirt posts coming up where I'm fully prepared to disclaim this information because the fit of my normal sizes are looser on me. I did not initially think twice about how that could be biasing my review of this dress, but as these are some of my favorite pieces I'll be sure to wear them again and will update how I feel about the fit once my ducks are in a row health wise. My stance that this version is a little tighter in the chest is accurate though--just by how much is where I may be corrected. 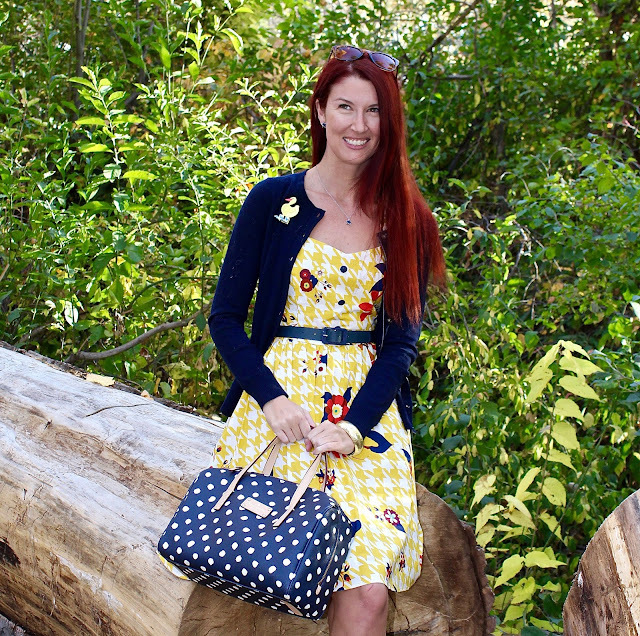 Style Details: Though I believe this can be a year round dress, something about the yellow just screams fall to me! Navy is just a great autumn color as well, so I decided to oversaturate with navy! The print on this dress is so adorable! Yes, you are so right, this dress is fabulous and you look fantastic! I liked the colors, I mean, the main pattern in yellow and white and then the flowers! I love fabric patterns like that, with a different one and then some flowers! You look stunning, so lovely hair too! Hope you have a very nice weekend! It is a beautiful dress! I love the mix of prints :) It's great it still fits you well even if the sizing has changed slightly. I love this dress! 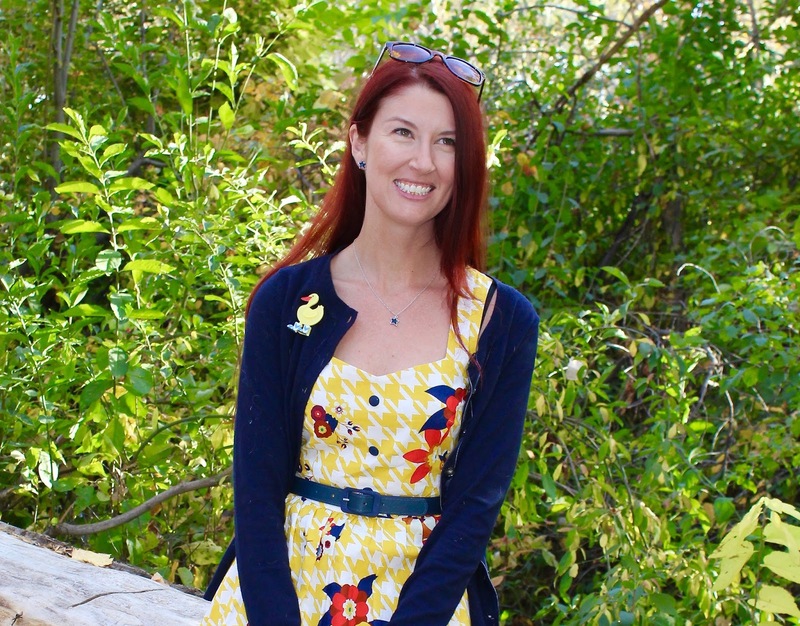 Like you I loved it right away when it first hit the Modcloth site! And like you again, it's taking me forever to add it to my collection. ;) Hopefully one day I will be able to call this one my own. Love the way you styled it with the blue. It's such a pretty dress on you! This dress has been sitting in my ModCloth shopping cart for months! Haha. I LOVE the colors and the print and the fit. And I love how you styled it with the blue cardigan and accessories. That brooch is too cute as well! You look gorgeous Lauren!! Loving the print and color combo here. As soon as i saw the dress I thought FALL :) Its so pretty and bright and definitely could be worn year round, but does have that fall vibe to it.